Caveat: The point is Merry Christmas! 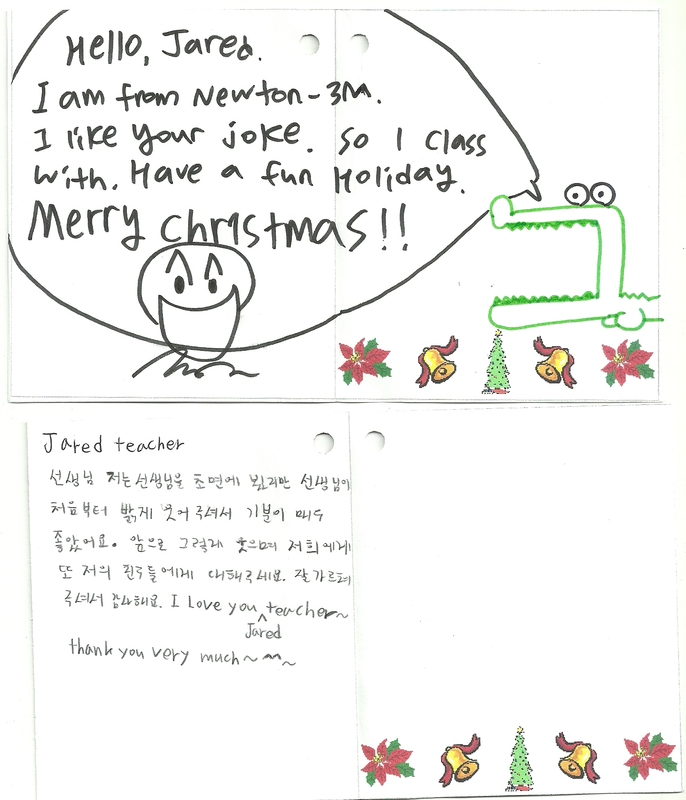 I received a very heartwarming Christmas card from one of my students last night. I think I felt especially touched by it for two reasons – it was clearly her own initiative and work, but also, she isn't the happiest student in the world, normally, so I felt glad that beyond her gloom-and-doom, laconic exterior she has some feelings and that I'd made an impression on her. 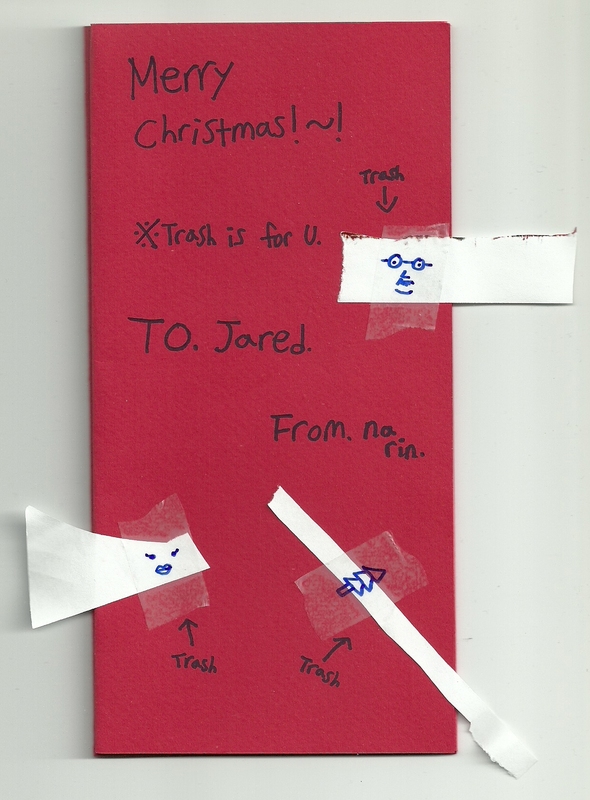 I am certain it was her own initiative, because no parent or teacher is likely to think it is a good idea to give a Christmas card on the theme of trash. She taped some scraps of paper on the front of the card (picture right), and labeled each one trash. This would seem strange if it weren't for a running joke in her class, where, to encourage the kids to pick up after themselves, I have told them repeately that I love trash, and that I have a special collection of it (in the trash can, of course). Sometimes when they leave the classroom they will hand me wadded up wrappers of scraps of paper and say "here is some trash for you, because I hear you love trash." So she is just extending the story. Inside is some word play on the basis of my name. Finally, there is this message (left), which I transcribe. Hi! 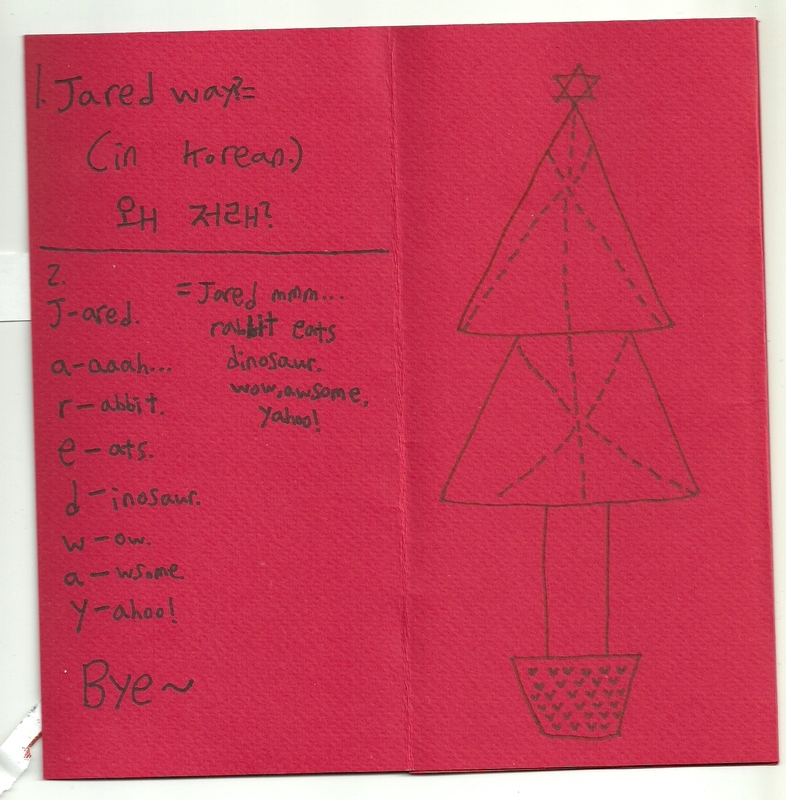 Jared! It's me! Narin. First, Thank you for te eaching me in Karma. I was bit of afraid cause I was afraid to new people. 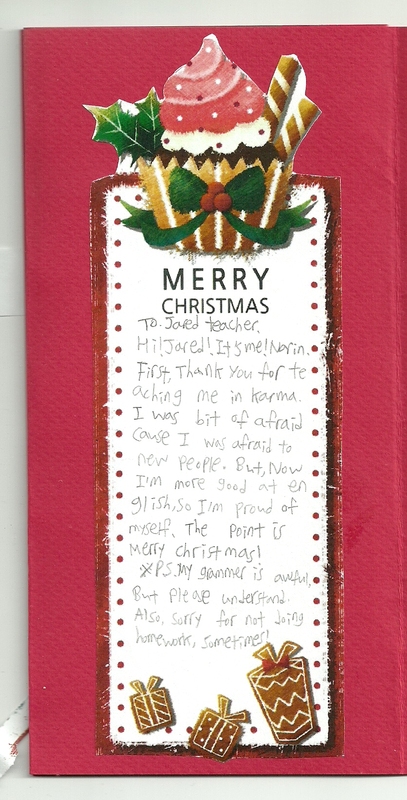 But, Now I'm more good at en glish, So I'm proud of myself. The point is Merry Christmas! ※ P.S. My grammer is awful, But please understand. Also, sorry for not doing homework, sometimes! I really liked the phrase "The point is Merry Christmas!" When I shared this with my coworker Kay, Kay astutely observed, "that sounds like the same way you talk." It is definitely what you might call a "TOEFL-style" phrase, to say the "The point is…." 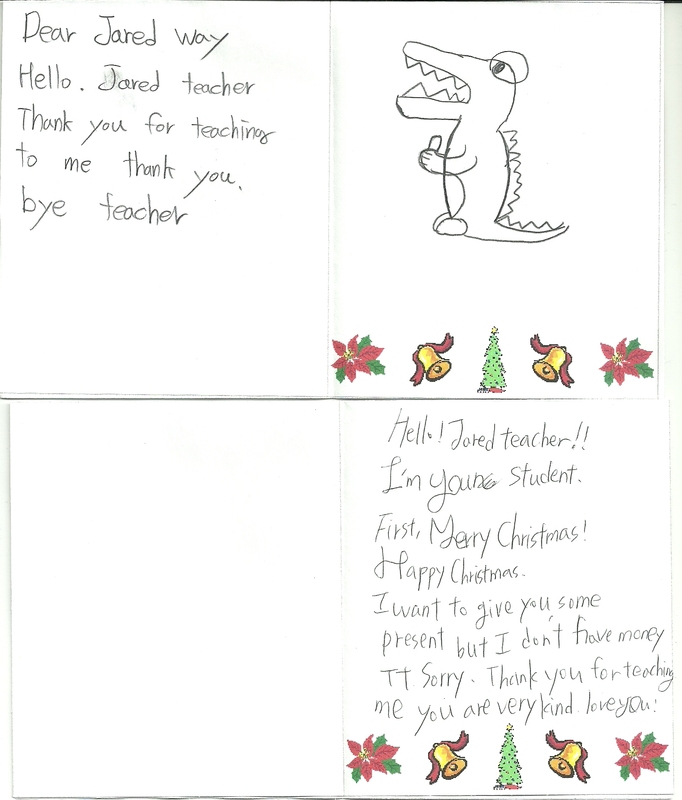 I also received some other touching and charming cards, but they weren't quite at the same level, having been clearly generated at the prompt of one of the other teachers, rather than a spontaneous, bespoke creation. Nevertheless, I was happy to have received them.